Today, it did an excellent job raining! I figured yard sales would be cancelled, but no ... they were out there. 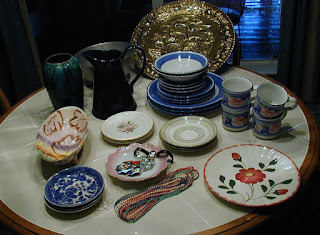 Found several great items to work with ... a great green water pitcher and some saucers that I'll start this week. The blue and white dishes will probably be set aside for an upcoming bird bath. And .... that great (UGLY) gold plastic dish in the very back is going to be an upcoming concrete experiment ..... if it'll stop raining ! !